Kimi Ryokan. Traditional and affordable stay with shared bathrooms; the ladies‘ floors are clean. You can book it here. Shibuya Excel Hotel. Right in the Shibuya area. You can book it here. Villa Fontaine. They have convenient business hotels, e.g. the ones in Shiodome and Nihonbashi. You can book them here. Park Hotel Tokyo. Nice 4* hotel in Shiodome, some rooms have view on the red-lit Tokyo Tower. You can book it here. Famous 5*Hotel Park Hyatt in Shinjuku area sets you back to the movie "Lost in Translation" with Bill Murray and Scarlett Johansson. You can book it here. Fresh Sushi and Sashimi at the Tsukiji Fish Market. Yakitori, chicken skewers at Omoide Yoko-cho (Memory Lane) close to Shinjuku station. Noooooodles: Ramen (thin curly ones), Soba (thin buckwheat), Udon (thick white ones). Bassanova is known for tasty Ramen and a great Udon place is Shikokuji. You can grab Onigiri – a filled triangular rice snack – in nearly every convenience store (called Konbini). Tempura: battered and fried seafood or vegetables. Izakaya: These are Japanese Tapas restaurants. You get a variety of dishes, sometimes served in Séparées. Don‘t miss the food courts in the big department stores! Tiny bar in Shibuya, as its name indicates: Tight. There are also other small bars in and around that alley. Two popular bars in Shibuya that you will not forget after visiting: The Red Bar and the Trump Room (club with golden interior). 4-floor Techno Club in the "Love Hotel" Area Maruyama-cho: Womb. Museum picks: The Mori Art Museum in Roppongi Hills, offers a nice view over the city. The Nezu Museum designed by architect Kengo Kuma shows Nezu Kaichiro‘s collection of pre-modern Japanese and East Asian art. The Meiji shrine is a green oasis in bustling Tokyo. Yoyogi park is a lively park where you can have picnics (buy a Bento box!) and watch street artists and cherry blossom trees (picnic + cherry blossom watching is called Hanami). Next door you can find the National Yoyogi Gymnasium, which was built by architect Kenzo Tange for the Tokyo Olympics in 1964. The Tokyo International Forum is a huge steel and glass complex designed by Rafael Viñoly. Looking for games? Then visit one of the many game parlors called Pachinko. Colorful and noisy! Don‘t forget to take a souvenir picture at the Purikura photo boxes. Looking for songs? Book a cabin to sing Karaoke. Want to see the Eiffel-Tower-inspired Tokyo Tower? And how about a night cruise in Tokyo‘s Odaiba Bay? Shopping area with nice small cafes and restaurants: Shimokitazawa. Another charming shopping street for fashion is Cat Street in Harajuku. To see some luxury retail architecture, check out Tod‘s and Mikimoto by Toyo Ito, Prada by Herzog & de Meuron, Dior by SANAA, Louis Vuitton by Jun Aoki and Omotesando Hills by Tadao Ando. Ameyoko shopping street is a colorful market along the tracks from Ueno station to Okachimachi station. Tokyu Hands, an amazing shop with thousands of products for all areas of life. AWAJISHIMA: Island in front of Kobe where architect Tadao Ando built a beautiful underground Water Temple and the 100 stepped garden at the Yumebutai Conference Center. BEPPU: Famous for its hot wells. You can stay at Nogami Honkan Ryokan with its own spa. You can book it here. HAKONE: Enjoy the view on Mount Fuji – maybe even from the edge of an Onsen bath. HIROSHIMA: Historic city with a nice river, be prepared for the peace museum. The peace center and memorial garden were designed by Kenzo Tange. IBARAKI: The famous Church of Light by architect Tadao Ando. ITO: The Fujiyoshi Onsen is a nice (mixed gender) Onsen close to Ito. KANAZAWA: Village with picturesque alleys and the Museum of Contemporary Art by architects SANAA. The Kenroku-en garden is one of the famous three gardens of Japan and Kanazawa also has a Noh Museum and beautiful Ninja Temple. KYOTO: Needless to say, really worth visiting, especially the former geisha neighborhoods and the Katsura gardens. A high-class hotel is the Nikko Princess. You can book it here. MIYAJIMA: Island with the famous Itsukushima shrine. NAGASAKI: City in the West with well-known Atomic Bomb Museum. NAOSHIMA: Wonderful island that you can discover by bike. Do visit the amazing underground Chichu Art Museum by Tadao Ando. Admire the pumpkin sculpture by Yayoi Kusama and enjoy a special onsen bath experience in the I Love You art onsen. Over night you can stay at affordable Cinnamon. Click here to see an overview map. NIKKO: See the famous red bridge and funny monkey sculptures or even real monkeys bathing in hot wells. 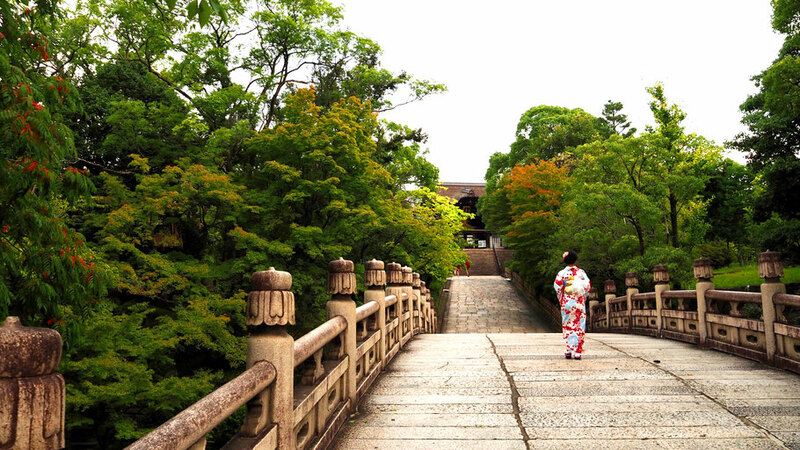 OKAYAMA: Here you can visit one of the famous three gardens of Japan, the Koraku-en. OSAKA: Try their speciality dish, Okonomiyaki, it is also fun to do yourself! Don‘t miss the famous Osaka Castle. If you have time you can visit the Sayamaike Museum by Ando. A very affordable hotel for a short stay is the Taiyo with shared bathroom. You can book it here. YAMAGUCHI: Beautiful Ruriko-ji temple with pagoda and Yudaonsen hot springs. YAMANKA: A place for more Onsen experiences. YOKOHAMA: Eat in Chinatown and visit the Osanbashi pier by architects FOA.